Blogging is one of the best ways to grow your business online. Blogs give you the opportunity to showcase your brand as an authority, publish consistent content and get more traffic to your website. However, just like with social media marketing, paid advertising and other online marketing strategies, there are several different steps and tasks involved with blogging. Creating, organizing, publishing and promoting content can take a lot of time. Luckily, there are some great blogging tools that help make the process easier for marketers who want to implement blogging into their content marketing strategy. We’ve compiled a list of the best blogging tools and here are 10 tools you should be using to pull in your target audience. Ready to Start Sharing Your Blog Content? Once you've leveraged these tools to create amazing blog content, learn how Sprout Social can help you publish your posts to social media for the most engagement! If you have an existing site that was built somewhere else, you can easily add it to WordPress. Your Web hosting company or Web developer can help you set this up. Once you have WordPress, you’re probably going to want to just jump right in and start creating blog posts. But before you do, you need to perform keyword research. Arguably one of the most important steps for blogging is keyword research. It’s all about finding the different terms and phrases that your target audience will use to find the specific content you’re publishing. Some businesses resort to just guessing what keywords they think people would use. But with the help of these two tools, you can get a more in-depth look at the exact phrases people are using. We combined these two tools on the list because they go together so well. 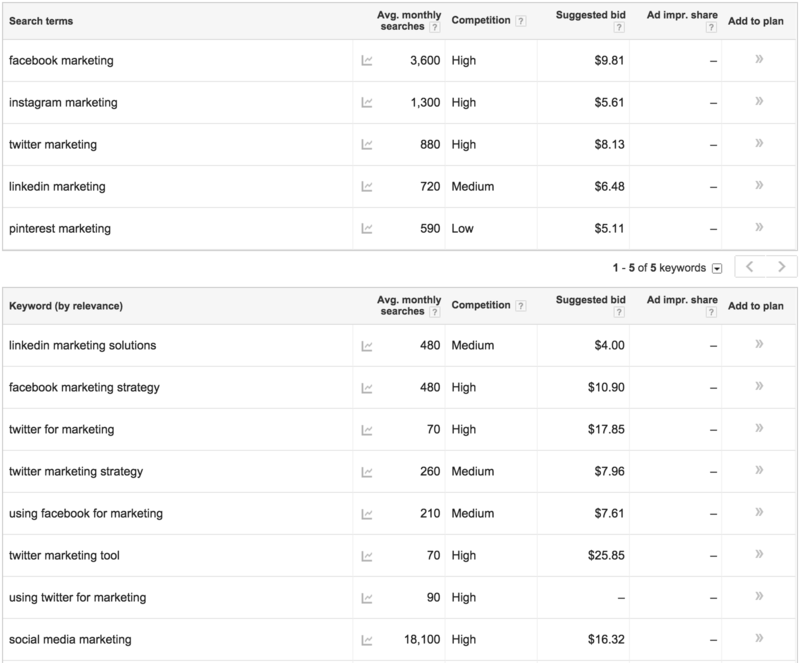 The Google Keyword Planner and Long Tail Pro allow you to enter in seed keywords and get a list of suggested search terms along with their search volume (the average number of people that search for that specific term each month on Google). The main difference between the the two tools is that Long Tail Pro gives you more information and has extra filtering options. Our post, How to Write a Blog Post for Search & Social Success will give you a good overview of how to use the Keyword Planner. 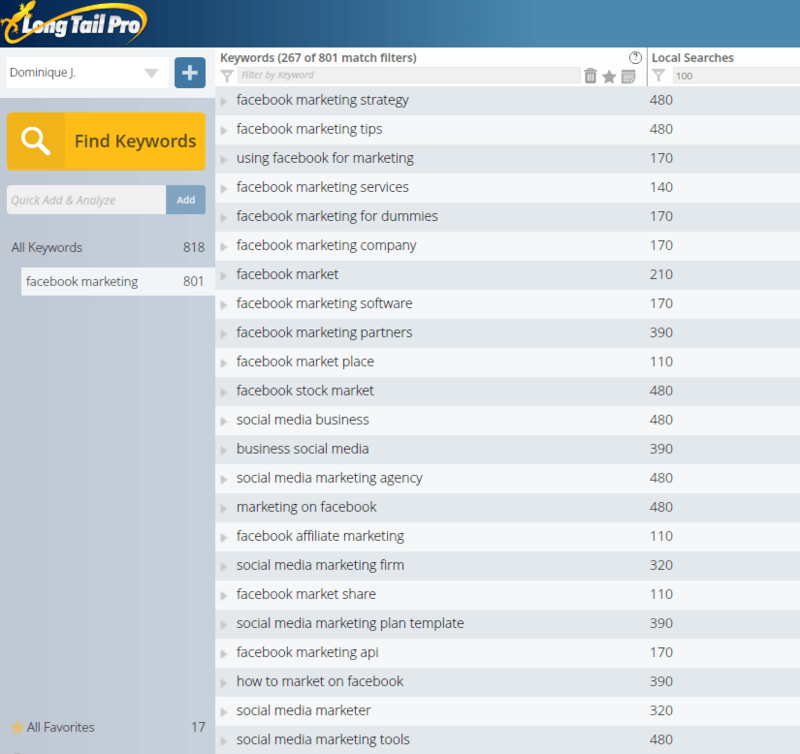 If you want to take your keyword research to the next level, you can take some of the keywords you got through the Keyword Planner and plug them into Long Tail Pro. This tool focuses on what’s known as long tail keywords. These are phrases that are generally over three words long and have a lower search volume. The benefit of these keywords is they are less competitive, more targeted to a specific audience and there are a lot of them. Keyword research will tremendously help you increase the chances of your blog being successful. Keyword Planner and Long Tail Pro are both very valuable blogging tools that will make keyword research easier and get you better results. You have your keywords chosen. Now, you need to come up with some different blog topics and titles focused around those keywords. There are numerous ways to come up with blog topics. But one of the most powerful methods is to find existing blog posts with your keywords already in them. It’s best to pick blogs that have seen success with social shares. That’s where BuzzSumo comes in. 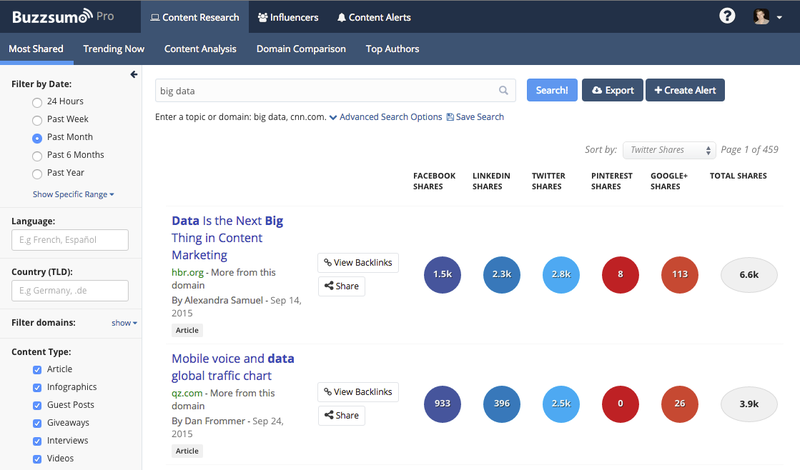 BuzzSumo lets you find blog posts that have been highly shared on social media. You just do a search for your main keyword and you’ll get a list of the latest and most shared blog posts related to your search. You can even search content your competitors have been sharing to see what’s working best for them. Then, you can create better versions of their most successful content to get more views. One of the most popular ways to get traffic to your blog posts, particularly if you don’t have an established audience, is through search engine optimization (SEO). Organic search traffic comes from people who use Google, Bing or other search engines from looking up specific phrases. Once they receive their results, they can enter your site. This is why it’s important to have a high rank on search engines, so you get more traffic to your blog. Having a blog post full of text makes your content less appealing and will immediately turn visitors off. Adding in visuals like infographics, charts and other images can help break up your content and make it easily digestible. The problem that a lot of bloggers run into is figuring out how to integrate images into their content. This leads to bloggers loading their posts with stock images that aren’t eye catching or of any value to the post. Canva is a free tool that makes it easy to create custom graphics to go with your blog posts. Whether you want to make infographics, featured images or just a few visuals to go within your posts, you can do it all in Canva. One of the best things about Canva is it comes loaded with templates so all of your graphics can be sized perfectly for each specific social media site. If you want an image to be easy for your readers to Pin, choose the Pinterest template. Or maybe you want something that people can Tweet. You’d then just choose the Twitter template. There’s a reason why 70% of marketers planned to increase their use of visual content in 2015. It works! Start making your blog posts pop by adding attention grabbing graphics instead of boring stock photos and walls of text. Would it shock you to find out the average college freshman reads at a 7th grade level? That means if your writing is too technically advanced, your audience may not fully understand your content. 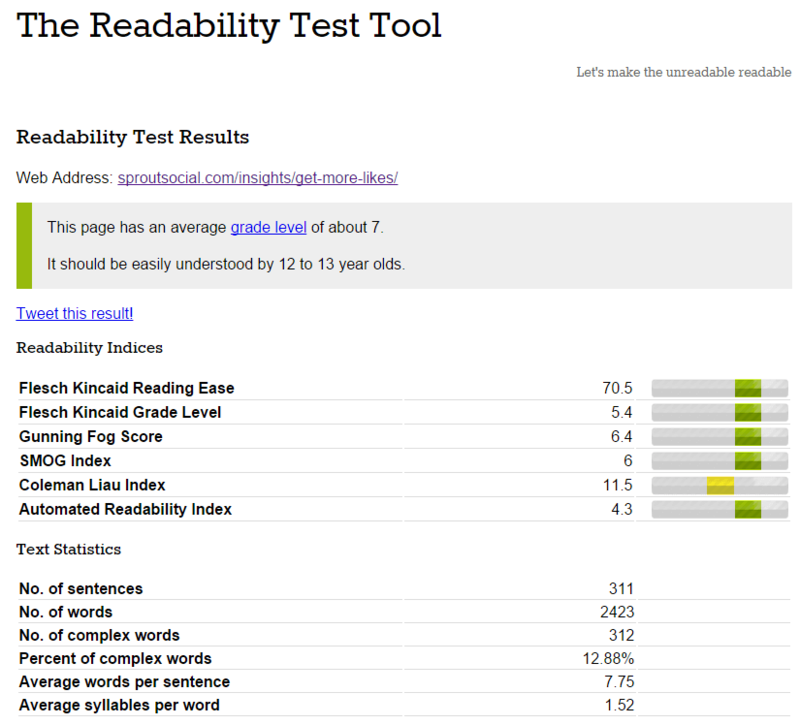 The Readability Test Tool helps you ensure your blog posts are easy to read. It uses the top readability indicators to let you know the approximate grade level of your content. The concept behind this is when text is easy to read, it’s generally more digestible. You should aim for your content to be around a middle school level (grades six through eight). If you’re in the green, that’s an indication that your content is easily readable. If you venture off into yellow or orange, then you may want to simplify your content a bit to make it more comprehensible for your audience. This blogging tool is critical for companies and marketers that create a large amount of content or for those who work in teams. Trello is essentially a project management tool focused around improving your workflow. You can create tasks, set due dates, add multiple team members and do almost everything you need to manage your entire blogging process. There are plenty of project management tools out there, but Trello is great for bloggers because it’s streamlined and doesn’t have a lot of the clutter that you don’t need. Something that bloggers aren’t aware of is that you can actually create a blogging editorial calendar in Trello. Here’s a template you can use to get started. Organization is key for bloggers, so Trello is definitely something worth adding to your list of blogging tools. You’ve created visually stunning content that’s perfect for SEO and readers, now what? It’s time to get the word out. Social media is easily one of the best ways to quickly generate activity for your blog posts. To do that, you’re going to need a social media management tool. You’ll want to use Sprout Social to schedule your posts to be sent out through your social media profiles like Twitter, Facebook and LinkedIn. It’s best to schedule your posts to go out multiple times throughout the week and even the month. 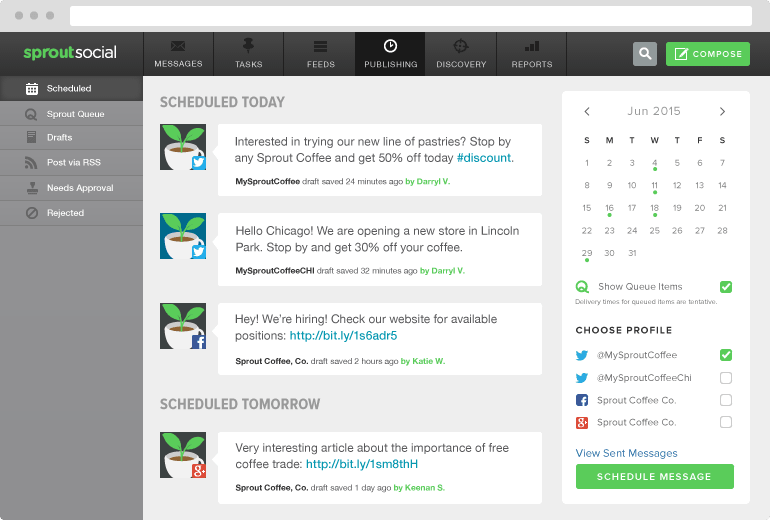 Sprout Social makes it easy to schedule your posts across your different profiles at once. You can even try testing out a few different headlines in your social media posts to see which generates the most clicks and activity. It’s simple to track your content’s performance on social media right from the dashboard too. Another great reason to use Sprout Social is for outreach marketing. A lot of marketers immediately think of sending emails for outreach. But sites like Twitter and LinkedIn, which thrive on building connections and interacting, are great for outreach as well. Through Sprout Social, you can find influencers in your industry and keep a log of your past conversations with each person. As you start to establish connections, Sprout makes it a lot easier for you to ask them to take a look at your new content. And hopefully, they’ll help spread the word about your blog posts too. Manually sharing your posts on each social network isn’t a good use of your time and it’s unnecessary. Start using Sprout Social to make your life a lot easier. In addition to social media, email marketing is another powerful way to spread the word about your latest blog posts. One of the most well-known bloggers, Neil Patel, has made it no secret that the emails he sends out to promote his new posts are one of his top sources of traffic. Emails let you reach out directly to your audience and update them whenever you have new content to share. An email marketing tool or autoresponder gives you the ability to collect email addresses and send out emails just like Patel. Once you set up your account and lists, get in the habit of sending emails on a regular basis and stay consistent to get the best results. Here are some amazing tips from a past #SproutChat on How to Attract & Retain Quality Email Subscribers. That’s our list of some of the top blogging tools to elevate your site. What are some of your favorite tools that you couldn’t blog without? Let us know in the comments!